Hours during which Rio de Janeiro drivers may legally run red lights in order to avoid being carjacked: 10 P.M. — 5 A.M.
Traffic is now available in Brazil, though I do not discuss the above. This incredibly oft-repeated idea — that cyclists are some grave threat to the lives of pedestrians, not motorists — is one of my greatest sources of irritation, and also puzzlement. I don’t have the NYC stats at hand, but in London, for example, from 2001 to 2005 there were 535 pedestrians killed by automobile. The number killed by cyclists? One. (the injury numbers are equally skewed, even taking into account possible underreporting). One obvious reason for this is that humans generally rely on an imprecise calculus for real and subjective risk (this book provides an excellent survey of risk analysis). Things that are novel or out of our perceived control invoke particular “dread”; so too do those things we can more easily remember. In New York City, an undercurrent of public opinion says that bicycles are “dangerous.” Neighborhoods have fought against the addition of bike lanes for this very reason. Yet one could count the number of people killed by bicycles in New York City each year on one hand, with a few ﬁngers left over, while many times that number of people are killed or severely injured by cars. When I met with Ryan Russo, an engineer with the New York City Department of Transportation, I could not help but hear the echo of several of the reasons why we misperceive risk. “It’s silent and it’s rare,” he told me, when I asked about New Yorkers’ antipathy toward cyclists. “As opposed to cars, which make noise and are prevalent. You don’t see it because it’s smaller, you don’t hear it approach because it’s silent, and you don’t expect it because it’s not prevalent.” A close call with a cyclist, no matter how less dangerous statistically, stands out as the greater risk than a close call with a car, even though—or in fact precisely because—pedestrians are constantly having near-hazardous encounters with turning cars in crosswalks. Following that idea that one does not expect it because it’s “not prevalent,” this might key in to the idea that novel risks are perceived more intensely than the everyday, mundane risks (like those posed to pedestrians from cars). There are other possible reasons. Pedestrians may not be cyclists as much as they are also drivers, so they may feel more a hostility to, or less kinship to, cyclists. People may not respect the legitimacy of cyclists as a form of transportation as much as they do automobiles. Maybe there’s something about the idea that cyclists are often found on sidewalks, and perhaps pedestrians view them as a more personal encroachment than cars, to whom the road “belongs” (I should point out that even when we’re talking about fatalities on sidewalks, cars are much more the prime offender). Another possible reason is what’s been dubbed here as “bikeism”; pedestrians may somehow deem the actions of cyclists as being part of their character, rather than to situational responses in the moment. Thus the action of one bad cyclists comes to taint all of cyclingdom, while the actions of many bad drivers are diffused into a sort of blameless norm. I was actually talking about this a bit recently with Dr. Oz (yes, he of Oprah fame) on his radio show. In theory, cyclists and pedestrians would enjoy more collegial relations (and maybe they do; maybe it’s only the people call in to complain to the DA who don’t like cyclists) because, unlike drivers, they are not shrouded in thousands of pounds of metal. Pedestrians and cyclists can often make eye contact (an agent of cooperation), they can literally feel each other’s humanity. Then again, maybe this only perversely raises the level of antagonism; and, as I mentioned in Traffic, people are more likely to refer to cyclists as cyclists, where they often talk about a car instead of the person driving that car. With a cycle there is less chance of the actor being subsumed by the vehicle; does the anonymity of the “car as threat” thus make it less memorable, or, again, less personal? To refresh, however, bicycles as an urban threat must surely be exceeded by any number of hazards, ranging from fatal slips down stairs to dog attacks. And they are vastly exceeded as a threat to pedestrians by cars. Cities would do well to run ad campaigns touting the benefits to everyone of cycling, and dispelling some of the falsehoods concerning risk (maybe a simple campaign, on bus sides, showing a car and a cycle, saying This is X Times More Dangerous Than This, or some such). Comments Off on The Phantom Menace. Click here to leave a comment. 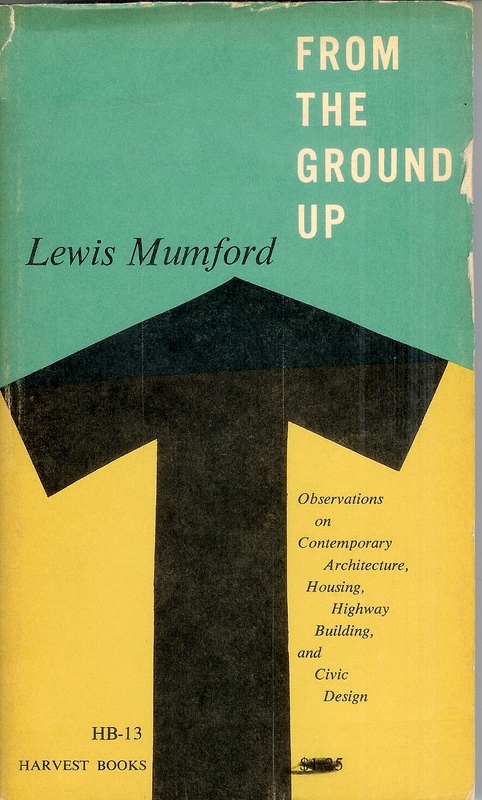 This weekend I chanced across the Lewis Mumford collection “From the Ground Up” on my bookshelves. The section titled “The Roaring Traffic’s Boom,” a selection of New Yorker pieces from 1955, makes for compelling reading, particularly for New Yorkers in light of some of the recent efforts (Times Square, etc.) by the NYC DOT. While some of Mumford’s cures (e.g., the ‘city for the motor age’) have not aged well, his diagnoses are always spot-on and the entire suite of essays is worth reading. Comments Off on The Roaring Traffic’s Boom. Click here to leave a comment.